I understood his fear. Our dear Amish friends are not known for their diet-friendly dessert options, but for them to make a dessert so good that they didn’t even want to share meant it was seriously indulgent. 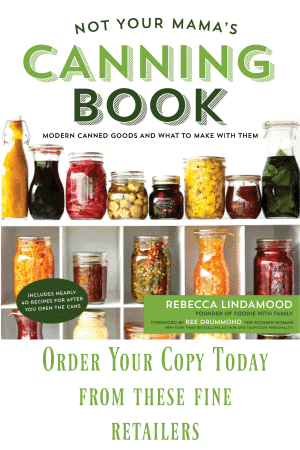 And so we looked at the ingredient list; a pound plus four tablespoons of butter, half a cup of white sugar, one cup of brown sugar, a can of sweetened condensed milk, and a few other odds and ends. We were BOTH in trouble. As I baked the sugar cookie bar base and the smell of warm butter and sugar filled the air, kids started filing through the kitchen wondering aloud what I was making. When I told them it was “something Anna calls Selfish Bars” they whooped, rubbed their hands gleefully, or breathed in sharply asking “when will it be done?” depending on the kid. People drifted in and out of the kitchen as the aroma of the bubbling caramel layer reached the far corners of the house. Everyone was banished while the chocolate layer melted and hovered during the seemingly interminable wait for the chocolate to firm back up to solid. Eventually, when they saw I wouldn’t budge, they drifted back into the den to watch a movie. You need to press the crumbly dough firmly into the pan, but don’t break your wrist to do it. As the butter and sugar melt in the hot oven, they’ll hold the works together. Do NOT walk away from the bubbling caramel. If you do, you are quite likely to find a scorched, smoking, sad old pan of burning caramel. It isn’t a hard job, it just requires you to stand there and stir. Don’t drop the chocolate chips on the caramel as soon as you’ve poured it. You want to give the caramel an opportunity to firm up a smidgen on the surface before plunking the chocolate onto it. Wait to attempt spreading the chocolate until it has all turned shiny all over. This means it has melted. I find an offset spatula is the best tool for evenly spreading the chocolate. If you don’t have an offset spatula, you can use a flexible silicone spatula. In a pinch, you can use a butterknife for the job… Just please, don’t use your tongue. WHAT? Am I the only one who thinks of those things? 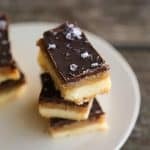 Decadent is the word for these Selfish Bars -Chocolate Caramel Sugar Cookie Bars. 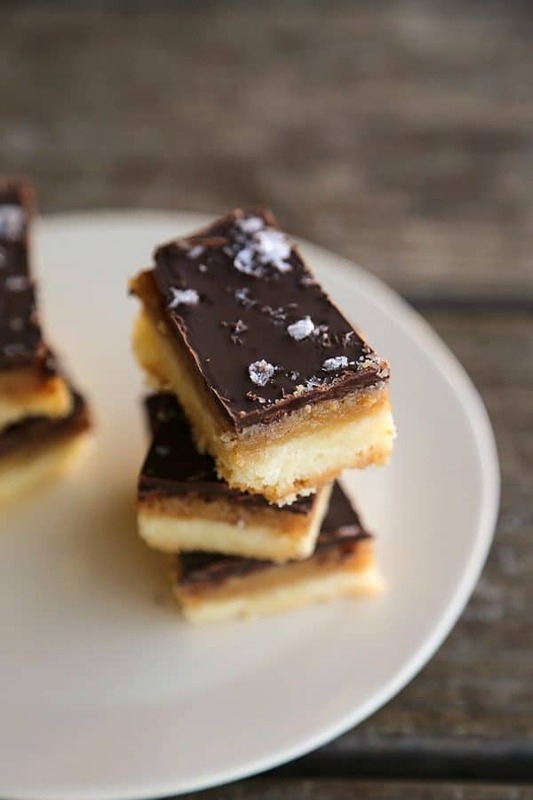 Sugar cookie bars covered with creamy brown sugar caramel, dark chocolate and sea salt. 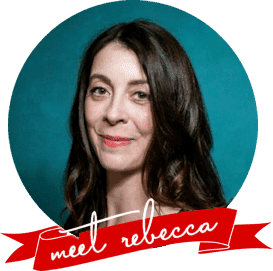 Use a food processor fitted with a metal blade or a mixing bowl with two forks to whisk together the flour, sugar and salt then pulse or cut in the butter until it is crumbly. Press into a buttered 9 x 13-inch pan or a quarter sheet pan. Bake for 20 to 22 minutes or until the crust has set and is golden brown at the edges. Remove the pan from the oven and place on a heatproof surface. In a medium saucepan over medium high heat, combine the ingredients for the sauce and bring to a boil, stirring frequently. As soon as it reaches a boil, set your timer for 5 minutes and stir constantly, scraping the bottom and sides of the pan to prevent scorching. Pour the hot caramel over the sugar cookie base and spread gently and evenly to the edges of the pan. Let stand for 10 minutes before sprinkling gently with the chocolate chips. Let the chocolate stand for 6 minutes, then use an offset spatula or silicone spatula to gently spread the chocolate into an even layer then sprinkle lightly with coarse sea salt. Let stand until firm, at least 2 hours or more, depending on room temperature. If you are impatient, you can refrigerate them to firm them up but this may cause the chocolate to have a dusty or chalky appearance. It will not make it taste bad, it just won't look as pretty. Want more decadent chocolate recipes like Selfish Bars? 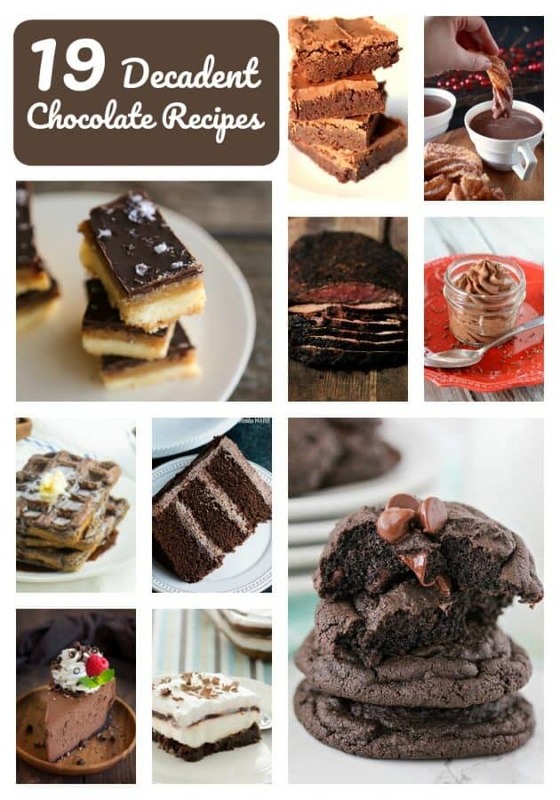 Celebrate National Chocolate Day with us and try these great recipes! Originally published October 26, 2015. Updated October 2017 with links and information. These look yummy! 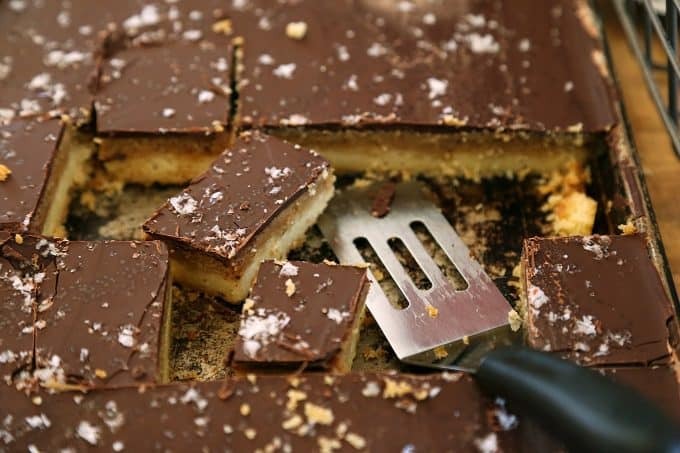 In Wales, we call a version of these, Millionaires Shortbread! Yaaaaasssss!! I had plenty of indulgent Amish desserts growing up on the East Coast. They know their sweets 🙂 I would happily give this a try! Finally got around to reading the whole post. Ugh. That picture of them all cut up… I would eat, like, 100 of these. Lord. Saw this and printed it right away. I then learned of a death in our family so made them to take to the family. Long story short, they never made it to the house. Some of us were reminiscing at the funeral home during the visitation and I mentioned I had these in my car, along with a few bottles of wine. We were soon having a good old fashioned Irish wake tailgate out of the trunk of my car. These bars were a hit! The person who had passed away always loved to see me coming to our family gatherings because I always brought dessert. He made sure to be the first person to greet me, just so he could see what I brought and sneak some before anyone else got the chance. He would have really enjoyed these! Thanks for the great recipe! And thank Anna for sharing it with you! What a sweet story, Theresa. I’m so glad you all liked them. Food can be such a powerful thing, can’t it? Dang it! I had forgotten these little devils until you snuck them into the weekly meal plan. (sigh) Time to recharge the Fitbit. Making them tomorrow, but is it a pound of better, or a cup of butter? Your comments say pound, but the recipe says cup. I am thinking cup, yes? Never mind. 1 pound total. Got it. I haven’t tried freezing them, but I imagine it would work pretty well! Please let me know how it works if you try it. Can these be made ahead? How should they be stored? Made these, they a really good. Had a prolem spreading the chocolate. I think next time I make them I will melt the chocolate & pour it on the caramel. It sounds like the chocolate wasn’t fully melted if it didn’t spread well. If you let the residual heat from the caramel melt them, they should become shiny and spread as easily as can be which saves you dirtying another dish. That being said, I see no reason why you shouldn’t melt the chocolate if you find it easier. I usually pop the pan back into the (cooling) oven for a few minutes. That does the trick! PS These are cooling on the counter now. Bringing them to a neighbourhood potluck tomorrow! I love chocolate and caramel together, so these look fantastic! Gonna make them anyway someday. HI–in your description you say two cups of brown sugar but the recipe only shows one cup. Which is correct? Hi Casse! Go with the printable recipe! Thank you for mentioning this to me. I’ll fix it to avoid any confusion! thank you! I made them as printed and the verdict was a resounding thumbs up from my co-workers. I will definitely make these again. Thank you! I’m so glad they went over well for you!